Michigan winter wheat was rated 75% good to excellent. The Michigan winter wheat yield is forecast at 73 bushels per acre, unchanged from the June 1 forecast. If realized, this will be a record high yield. Michigan winter wheat was rated 75% good to excellent during the week ended June 27. 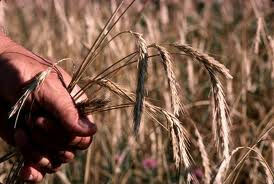 Forty-eight percent of wheat was turning yellow behind the 5 year average of 60%. This was due to a cooler and wetter than normal spring. Growers in southern Michigan began harvest the week of July 10. Oat yield in Michigan is forecast at 63 bushels per acre, down 5 bushels from last year. Oat planting was delayed this spring because growers were unable to get equipment on fields due to excessive moisture. Michigan oats were rated 62% good to excellent during the week ended June 27. Forty-one percent of oats were headed during the same week; the 5 year average was 68%. Nationally, winter wheat production is forecast at 1.49 billion bushels, up 3% from last month and up slightly from 2010. The United States yield is forecast at 46.2 bushels per acre, up 0.9 bushel from last month but down 0.6 bushel from last year. The area expected to be harvested for grain totals 32.3 million acres, unchanged from the Acreage report released on June 30, but up 2% from last year. U.S. oat production is forecast at 56.6 million bushels, down 30% from 2010. If realized, this will be the lowest production on record, surpassing the previous record low set last year. Based on conditions as of July 1, the average yield for the United States is forecast at 60.5 bushels per acre, down 3.8 bushels from 2010. Growers expect to harvest 934,000 acres for grain or seed, unchanged from the previous forecast but down 26% from last year.